These tech stocks are making big moves in their respective markets and rewarding their shareholders with dividends at the same time. Finding great technology stocks that are not only benefiting from current trends but also investing in future ones is a difficult task. And hunting down tech companies that pay a good dividend adds an extra layer of complexity. That's why we asked three Motley Fool contributors for their thoughts on technology stocks that are both investing in their tech futures and offering solid dividend yields. They came back with Corning (NYSE:GLW), Texas Instruments (NASDAQ:TXN), and Verizon Communications (NYSE:VZ). Here's why. 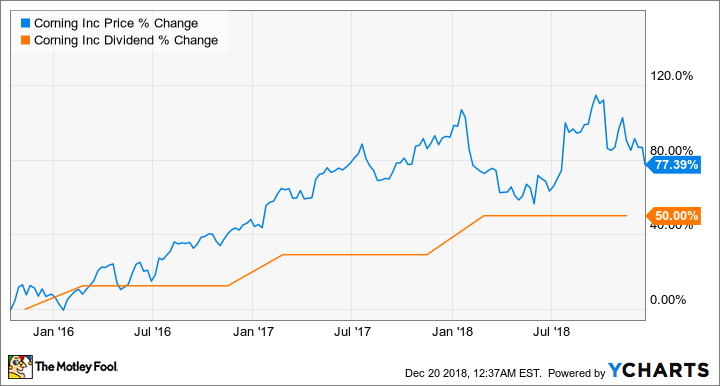 Buy this high-yield tech giant at its "inflection point"
Steve Symington (Corning): Corning might not be your typical "high-yielder" with an annual yield of roughly 2.4% at today's prices. But investors should remember that the glass technologist has increased its dividend by 50% since it put into motion a four-year strategy and capital allocation framework in late 2015. This means Corning drastically overdelivered relative to its promise to boost its payout by at least 10% each year under the framework -- and that's in addition to its nearly 80% share-price appreciation over the same period. To be fair, Corning's past performance isn't necessarily indicative of its future potential. But I would be shocked if the company didn't replace its framework with a similar plan when it concludes this year. And even then, Corning's latest quarterly results in October showed an acceleration in top- and bottom-line growth as the investments it made in both operational efficiency and capturing future growth opportunities have begun to yield fruit. In fact, Corning CFO Tony Tripeny mused the company has finally "passed an inflection point" where it's "gaining momentum and plan[s] to build on that going forward." For investors willing to buy now and bet that Corning does exactly that, I think the stock should continue delivering market-beating gains. Anders Bylund (Texas Instruments): This inveterate semiconductor company is about as stable and diversified as they come. You'll find TI's chips inside many everyday devices, from smartphones and calculators to cars and industrial manufacturing equipment. Rather than focusing exclusively on a handful of markets and opportunities, the company produces thousands of different analog or embedded processors that address nearly every processing and sensor need. That being said, TI derives more than half of its annual sales from automotive and industrial computing -- two sectors where management sees outsized growth drivers for the long run. This strategy powers a fantastic cash machine. Over the last four quarters, TI's $15.8 billion in top-line sales generated $5.9 billion of free cash flows. That's a 37% cash flow margin, an efficiency level that most of its competitors would kill for. And those massive cash flows, based on ultimate diversity, are funneled right back into investors' pockets. "Our goal is to return all of our free cash flow to owners in the form of dividends and stock repurchases," according to the company's official investor overview. Dividend payouts have been increased in each of the last 15 years to power a 3.4% yield today. Long-term stability, promising growth markets, efficient cash generation, and a commitment to shareholder-friendly cash returns come together to make Texas Instruments a terrific dividend play on the tech sector. Chris Neiger (Verizon): For investors looking for a tech company with a sky-high dividend, it doesn't get much better than Verizon. The telecom giant pays a generous 4.3% yield with 12 consecutive years of raising it, and the telecom is building out its wireless business to benefit from new tech trends like 5G. The company has been investing in 5G wireless, and toward the end of 2018, Verizon launched the first-ever 5G commercial product. That's notable because 5G is the next step in enabling mobile devices and Internet of Things technology to connect to the internet faster than ever before. Verizon's early moves in this space mean that the company is likely to take advantage of first-mover advantages in this new space similar to how it outpaced rivals in the early days of 4G. Verizon has managed to grow its wireless customers base despite increased competition from other U.S. telecoms, and in the most recent quarter, the company added 515,000 retail postpaid net additions. That's no easy feat considering its competitors typically offer cheaper plans, but customers have been drawn to Verizon's strong network. RootMetrics, an independent company that regularly ranks wireless networks on their performance, said in mid-2018 that "Verizon's performance in our national testing remained outstanding and far stronger than that of any other carrier." With the best wireless network in the country, strong subscriber growth, and upcoming 5G opportunities, Verizon is poised to continue outpacing its competition. Add to all of that the fact that Verizon pays a very generous dividend and this telecom looks like great dividend stock for tech investors. Check out the latest Corning, Texas Instruments, and Verizon earnings call transcripts.